Often, your day-to-day tasks come with built-in accountability and require your attention. Employees and suppliers need paying, clients need servicing and regulatory bodies demand you toe the line. But the most critical activities – the ones that will actually determine success in business – don’t come with looming deadlines, legal threats or immediate cash in the bank. It’s why working on the business is so often put off, sometimes forever. When you hold yourself accountable to your goal, you’re saying to yourself and the rest of the world that it’s a priority – anything less is just wishful thinking. While you may truly believe a goal is important to you, it’s easy to be consumed by the business of life. Then a year goes by, and you’re no further along. What’s missing in that story is not willpower, but accountability. If you’re not stopping to ask yourself, each day, if you’ve lived up to your plans and expectations, you’ll almost certainly keep bumping between things that demand attention, but aren’t, on balance, all that important – things like TV, scrolling through Facebook, and taking on work you don’t enjoy. So what can you do to build accountability into your life? That starts with being absolutely clear on what you want, and when you want it. When you have those goals set, here’s how to make sure you can trust yourself to be ever working towards your dreams. Bigger goals are hard to measure progress against – and they’re not all that motivating. ‘Grow repeat business 35% by December’ can seem both totally impossible and far enough away that it doesn’t matter. If you instead ask yourself, “What can I do each day that will grow my repeat business?”, the picture changes significantly. That means you tick things off your list – meet with three prospects a week, contact four existing clients a week, etc – that keep you on track towards your goal – and motivated. Whispering your goals to yourself is one thing, writing them down is another. It’s a psychological trick, but it works. Writing things down makes them real, and can help keep you accountable, especially if you display them in a prominent place and review them each day. As a business owner, it’s important to be honest with yourself when you fall short. You don’t have to beat yourself up about it, it just means acknowledging when you’ve made a misstep, and making a plan to avoid doing it again. If you find yourself a repeat offender, it’s worth asking yourself why you keep failing to complete a task. Perhaps you have an emotional or practical block, or the goal you’ve set for yourself isn’t something you genuinely want. If that’s the case, it’s entirely possible you’re either unmotivated, or worse, unconsciously sabotaging your progress. A study from The American Society of Training and Development found that you have 65% more chance of achieving your goal if you commit to someone else. Even better, if you make a date to review where you’re at with the goal, your chances increase to 95%. Working with a business coach can help. With regular catch-ups, your coach will help you set goals and stay on track as you work towards them. They’ll also help you develop strategies to overcome performance issues and business challenges. 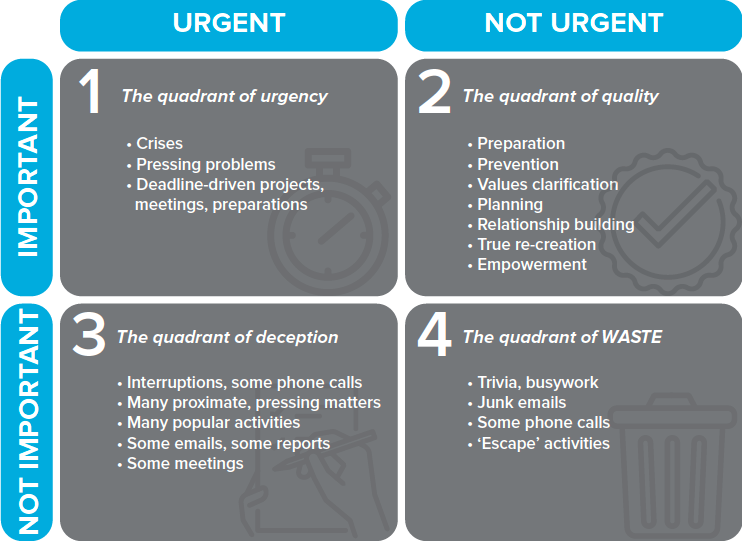 When things are a true priority, your schedule should morph to fit around them, not the other way around. So many of us unconsciously believe we can leave our goal-oriented tasks for moments when all other work is finished. Of course, we all know that our work will always expand to fill the available hours – that is, there will be no free time. Instead, schedule time into your week that’s reserved exclusively for working towards your goal. If it helps, you could plot your ideal week, with time allotted for work, exercise, personal life, travel time and your goal tasks. This gives you a clearer idea of where your best use of time is, and will mean the other critical areas of your life won’t be neglected. Accountability doesn’t stop when you become your own boss. There are still the usual demands – paying staff, keeping clients happy, staying compliant – but it’s important to recognise that to grow and succeed in your business, you need to set and achieve goals that don’t have immediate time or money pressures attached. Accountability isn’t a set-and-forget kind of thing, but involves ongoing tasks that you write down, give your attention to every day, and regularly review to check your progress. Neither should you be neglecting non-business, but still essential parts of your life – family, exercise and other aspects that enhance your health and wellbeing. A business coach can help you formulate goals, stick to your plans, organise your time and stay accountable to yourself and your business – and that way lies success. Newer PostAre you bringing your A game or your O game?